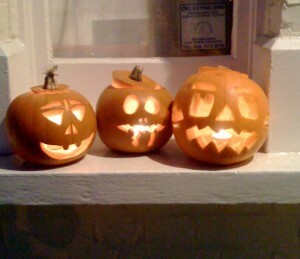 We had a great Halloween here in old London town. We must have had 10-15 sets of kids – probably 40-50 kids in all – drop by for some trick or treating. That’s way more than we ever got in new York, although living in a Manhattan apartment building obviously makes the whole experience somewhat different than we would have had had we been in the ‘burbs. And they were all so polite, even the teenagers, only taking one thing, despite Sally urging them to grab a handful! – and saying ‘thank you’ each time. One group that dropped by, addressed me as Mr Man: “thank you, Mr Man,” they chimed. We met more of our neighbors, including another American woman married to an English bloke. Next year we’ll have a proper party of our own.